Okay. Now for some really exciting news. 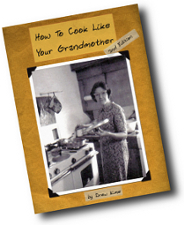 Drew over at How To Cook Like Your Grandmother has created an all-new, color, illustrated version of his cookbook. And he’s giving away three copies! Drew is the guy who taught me how to render beef tallow (among many other interesting and handy kitchen skills I didn’t pick up from my own grandmother). Plus, he’s the author of my all-time favorite French Onion Soup recipe. Knowing Drew, you can bet that this cookbook is not just your average cookbook.